When Rachel and Carolyn announced that they were planning a Virago Reading Week for this week, I was very excited. I’ve gathered a nice little collection of Virago Modern Classics, several of them editions with the iconic green spine well known by Virago lovers; perhaps this week would motivate me to finally take one off the shelf and read it! I decided to start with the green VMC that I believe has been on my shelves the longest, Spinster by Sylvia Ashton-Warner. And now I’m in the awkward position of coming to the Virago party with a less than laudatory post. Before I launch into a description of my problems, let me step back and tell you a bit about the book. 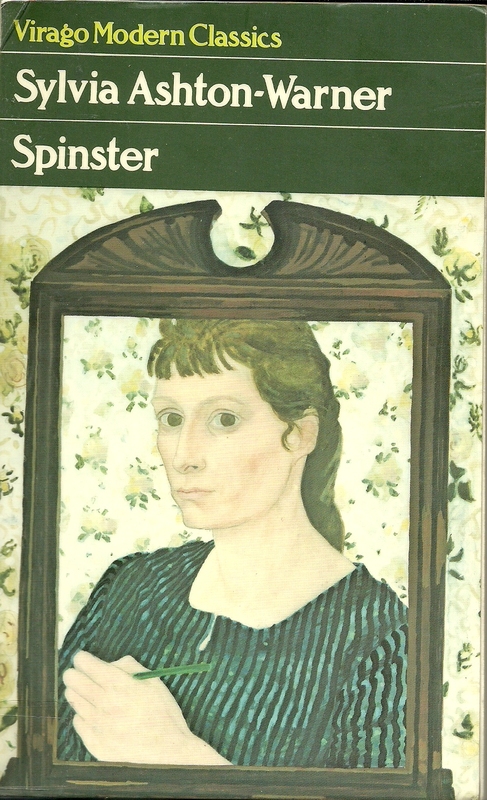 Initially published in 1958, Spinster is the story of a 34-year-old woman named Anna Vorontosov who teaches young Māori and white children in a small New Zealand school. Written from Anna’s first-person point of view and in a stream-of-consciousness style, the book takes readers through a year in Anna’s life. When the novel begins, a new young teacher named Paul Vercoe has just joined the school, and Anna’s job appears to be in some sort of jeopardy. Anna launches herself into each day with a brandy, and she defends the trees in the schoolyard while looking for some sort of key that will enable her to reach the small children in her care. I have a love/hate relationship with stream-of-consciousness narration. Done well, it can be extremely effective, but it’s tough to bring readers into a character’s mind. The character doesn’t have to explain her thoughts to herself, the associations and wanderings in her mind make sense to her, but they won’t necessarily make sense to the reader. Stepping into this book felt far too much like stepping into the middle of a story, and it took me a while to feel I understood much of anything. This struggle to understand would be forgivable if it had led me into the mind of an interesting character, but I wasn’t far into the book before I developed an intense dislike for Anna. She is the embodiment of almost every unpleasant stereotype I can think of about spinsters. As a never-married woman approaching 40, I was hoping this book would be a celebration of what a spinster’s life can be or, failing that, a serious examination of some of the trials of the solitary life. But Anna was so pathetic that I could not take an interest in her. She’s afraid of men and annoyingly naive about them; she spends much of her time mooning over Eugene, the love she gave up years ago, and mourning for the children they might have had. Although she claims (and sometimes exhibits) devotion to her Little Ones at the school, whenever a man enters the picture, her emotions are thrown into a tailspin. I know women like her exist—and perhaps many of us have moments of being such women—but I don’t want to spend a whole book in the mind of such a woman. What makes it worse is that Ashton-Warner herself was a married teacher in New Zealand and, according to the introduction to this edition, Anna “was based on the devoted, admirable unmarried women who had been important to the author in her days at school and as a trainee teacher.” So it’s not even an accurate rendering of an actual spinster’s inner life, which I could accept more easily. Instead, it draws from the married author’s assumptions about spinster life, and that just rubs me the wrong way. At about the halfway point, I very nearly gave up and even drafted a post about why I didn’t finish. However, I decided to press on because there is some arresting prose in the book, and I enjoyed Anna’s interactions with the children. There are some hilarious sequences in which each child in the room mispronounces her name, Vorontosov, in a different way: Miss Vottot, Miss Vontofoff, Miss Voffa, Miss Foffof. I was also vaguely interested in some of her educational ideas, which I understand did draw from Ashton-Warner’s own teaching experiences. The last half of the book, which focused more on Anna’s teaching, was a big improvement over the frustrating first half; however, Anna’s tendency toward melodramatic flights of fancy continued to annoy me. Although I regret that my Virago Reading Week post is a bit of a downer, I’m sure I’ll find many other wonderful Viragos to read from others’ posts. Rachel and Carolyn are posting round-ups of the various Virago-themed reviews, giveaways, and more at their blogs, so check those out for possibly more appealing Virago choices. Oh Teresa. I’m so sorry you had such a disappointment with this. It sounds like a book I would have an issue with too – the treatment of single women in fiction is generally unflattering, and there is nothing more patronising than being portrayed as unfulfilled, miserable and man obsessed by women who have retreated into the realm of the smug married. What a shame that this couldn’t take the opportunity to explore a deeper view of independent womanhood. I shan’t bother picking it up now – you’ve got me enraged by your review alone! It was so frustrating, but I probably would have been far less annoyed if it had been written by an actual spinster. I wouldn’t have liked her any more than I did, but at least I could shrug it off as her experience. I’ve been really lucky in my married friends (and most of my close friends are married). I can only think of one or two times when I’ve felt a friend was acting like a “smug married” person. I think it helps actually spending time with people of a different status so you can see that there’s good and bad in both ways of living. I don’t generally do well with stream of consciousness writing either, so I think I would have struggled with this one as well. It does sound like an unflattering representation of unmarried women. I wonder what the intro had to say about the book (if there was one?). I had not heard of this author before your post, but I might have to take a pass if I come across a used copy of this. There’s a paragraph in the introduction about Anna’s more annoying mental habits, and the author (Fleur Adcock) acknowledges that the description of Anna sounds like a negative. But the bulk of the introduction focused more on the teaching, which was the more interesting part of the book. Ashton-Warner apparently wrote the book to share some of her ideas about teaching after not having success writing nonfiction about it. Well at least you finished it. I didn’t even make the half way mark and I live in NZ. May be I will return it to the shelf for sometime in the future. I’m glad to know I’m not alone in my dislike. It does get a little better in the second half, but it never got great. Well it is still being used here in Sri Lanka on official documents/ I never looked at it like this before actually ! And I totally agree about getting lots of reading ideas from the Virago Reading Week!